Less expensive condos for sale in Scottsdale are getting scarce. 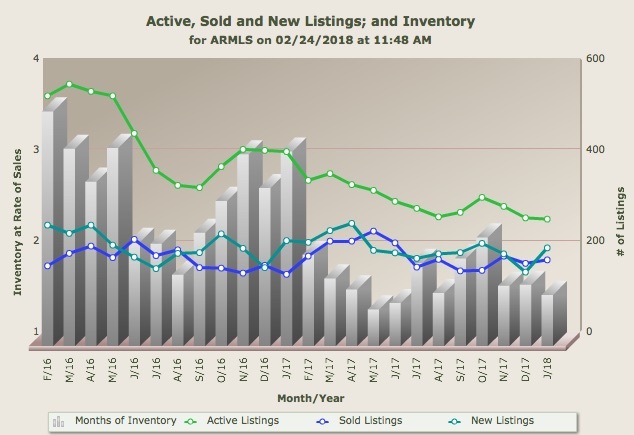 The number of active listings for condos and townhomes in Scottsdale listed under $300,000 has reached a two year low, at 247. That's 1.56 months of inventory, meaning if no new condos came on the market, the supply of condos for sale would be exhausted in 45 days. And also, that means prices will be on the rise for this market segment and competition will be fierce for the most upgraded listings. Brand new one bedroom condos can still be found under $300,000 in places like Inspire on Earll. Envy in downtown Scottsdale also squeeks in under $300k. These will be small units, in the 800 square foot range, in downtown Scottsdale, but the amenities in these buildings, like rooftop pools and large workout studios, may just wow you enough to want to fit into a smaller space. Two-bedroom condos in a resort environment are still available under $300,000. Venu at Grayhawk offers resort style pools and an incredible clubhouse with fitness classes and other events. Plus your car will be happy here too, with a garage that comes with every condo. Raintree Resort Casitas have a great location near Kierland and give owners spacious interiors and a resort-style pool area with spa. To see more condos under $300k, use our Browse by Price Range page and select $300,000 as the max price. If you're looking for the best place under $300,000, make sure you start early and use a condo expert to help you find the place that's right for you. Open and spacious homes in Raintree Resort Casitas welcome you to a year-round tropical oasis right in the heart of Scottsdale. Relax in the resort-style pool and spa in the center of the community or on your own private balcony or patio, some with views of the McDowell Mountains. Open floor plans compliment convenient features like niches in the entertainment center and dual master suites. Introducing Envy, a new condominium development near the Scottsdale entertainment district and Old Town. This prime location puts dining, shopping, sports facilities and nightlife just blocks away. Within the luxury community residents will have access to amenities like on-site personal training in a state-of-the-art fitness facility, Black Label Lounge and an opulent pool and accompanying lounge.